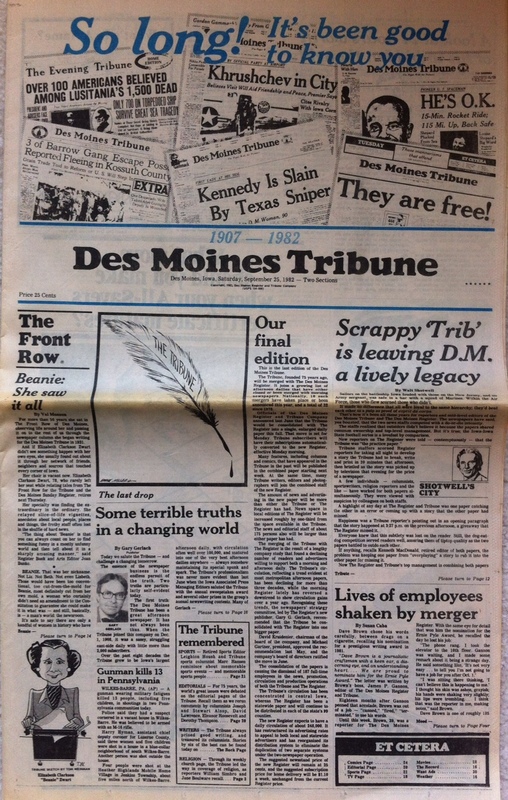 I learned a lot when the Des Moines Tribune died 30 years ago. The last edition of the Trib published Sept. 25, 1982, but that followed a summer filled with lessons (some of which took some time to sink in). A little background before I review the lessons: I started working at the Des Moines Register in 1977. The Register, distributed each morning in each of Iowa’s 99 counties, covered the whole state. The afternoon Tribune covered central Iowa. We competed feistily in a few areas such as Iowa politics, state government and Des Moines news, but it wasn’t exactly a fair competition: The Register had a larger staff and a national reputation. Even though the Tribune had several outstanding journalists who measured up with the best anywhere, the Register simply had more firepower. It also wasn’t a genuine competition: However fiercely we competed as journalists, we were owned by the same company. Whatever profits we made helped the same bottom line and whatever resources we wasted hurt the same bottom line. But it was sincere and fierce competition nonetheless: We lorded our national reputation over the Trib and sneered at it as the “practice paper.” They exulted over every scoop they achieved on their smaller turf. Though we shared the same newsroom, we didn’t socialize much with the enemy and we talked in hushed tones about competitive stories lest the other side would hear our plans. Register staffers especially loved “Tribfucking” – when a Register reporter got wind from a source (or sometimes from eavesdropping or snooping within the newsroom) about a story the Trib was working on and beat them into print with the story or a piece of it. I’m sure Tribbers had a similarly crude term for beating us. We also loved to cover a story so thoroughly that we nailed down not just the day’s main news angles but the likely second-day angles the Trib could pursue. Competition improves your game. I know the Register gave its readers better stories in many situations and on many days because we wanted to stay ahead of the Tribune. And subscribers who took both papers got stellar coverage from the two staffs’ competitive efforts. Competition keeps you on your toes and we had to be on our toes in that competitive newsroom. Tribfucking is wasteful. That 1982 legislative session, we had six standout reporters covering Iowa government and politics: Jim Flansburg, Dave Yepsen, Diane Graham and Chuck Bullard on the Register, Tom Witosky and Dewey Knudson on the Trib. Whatever the merits of competition, often Tom and Dewey were working on the same stories as Register reporters (even if they were diligently seeking different angles). We could have done more and better enterprise with six reporters all working together. We had similar wasteful duplication in coverage of local government, education and some other beats. In a few cases we avoided duplication: Bill Simbro covered religion for both. Sports writers served both papers, though the Trib had its own sports columnist (Marc Hansen was the last one and retired recently after a long career as a Register columnist in sports and general news). I worked later at the Omaha World-Herald, which published both morning and evening editions, but without competing staffs, when I worked there from 1993 to 2005 (with a two-year interruption for a return to Des Moines). While the World-Herald was never anywhere near as great a paper as the Register was before and after the death of the Tribune, that was a good business decision, and I wonder how things might have played out in Des Moines if executives had decided to shift to publishing morning and evening editions with a single staff. The World-Herald appears to still publish in the evening. Wikipedia says so, and the circulation department is open until 9 p.m.
Move swiftly after you make big decisions. I don’t know when the Register and Tribune executives decided to kill the Tribune and how long they hoped to keep the secret before announcing. But they didn’t move swiftly enough. Reporter Arnold Garson learned what was up. Arnie broke the story in the Register and had the byline on the lead story in that afternoon’s Tribune announcing the move. I have seen news wait until a company wanted to announce a newsworthy decision, but I have seen other instances (including my hiring as editor in Cedar Rapids 26 years later) when enterprising reporters learned news that someone was waiting to announce. When you make a decision, you should move quickly and announce it yourself on your terms. Waiting to dot every i often backfires. Don’t sugarcoat. That announcement that the company was combining the two papers was BS. The company was killing the Tribune and should have acknowledged it. Except for perhaps on the comics page, the combining was minimal and non-memorable. What I do remember is that when bosses BS their staffs (or when a company BSes the community), you hurt your credibility. Bosses and newspapers need credibility. You shouldn’t fritter it away on stories people won’t believe anyway. When you make tough decisions about the future, credibility is important for that future, and you harm your credibility by failing to own your decision and acknowledge honestly what you’re doing. When you kill an organization with a proud history, it deserves a death with dignity, and that includes recognition of the death. The June 1982 pretense that the papers were combining had largely vanished by the end in September. The final front page, pictured above, gave proper tribute to the dying Trib. And the Trib got a proper wake, saluted by staffers at a party that included a showing of the great Humphrey Bogart movie, “Deadline U.S.A.” I’ve embedded a few clips below. It’s a great movie, if hokey, about a dying newspaper. Being honest about what you’re doing is more than just a matter of honesty and consideration for those who need to mourn. Just as NAA would be better served by facing the future than pretending it’s continuing the work of API, the Register might have positioned itself better for its future by deciding what the Register should be rather than pretending it was combining the Register and Tribune. Face the music. While Register and Tribune executives lost some credibility for pretending that we were combining the newspapers, they earned respect for delivering the bad news personally to staff members who lost their jobs (about 55 in the newsroom, as I recall). Editor Jim Gannon and Managing Editors Dave Witke and Bill Maurer met personally with every newsroom staffer to let us know the good or bad news (often it was mixed, with some people keeping their jobs but not liking their new roles). I heard admiration for how the top editors handled that process from people who left as well as people who stayed. And I remembered 27 years later when the Gazette cut its staff. I personally told each of the journalists who lost their jobs. Diversity matters. The org chart showing top managers of the merged Register newsroom listed only white males (I was in the next tier of managers, not listed on the org chart). The lack of diversity sent a strong message to the women in the newsroom, who were plentiful but not high-placed, and to the few members of racial and ethnic minority groups. While the white male editors were strong journalists, some women and minority editors who were at least as well-respected by the staff would have given us a stronger leadership team. The failure to diversify during such a significant reorganization was a huge lost opportunity. Get the organization right. That newsroom needed one managing editor running the day-to-day operations. Dave was an outstanding managing editor of the Register before the Trib died and Bill was an outstanding managing editor of the Trib. I don’t know the reasons for the decision to proceed with two managing editors, but I can presume that the thinking was that if you chose one, it would be perceived as a victory for one former staff over the other. Plus they were both outstanding editors and good people; it would be a tough choice. So they split the duties. And we had dual managing editors for the next year or two. It was a bad situation, unfair to both men and to the newsroom. Eventually, (in 1984, I think), Arnie took over as the sole managing editor. Competition builds respect. However derisive Register staffers were of the “practice paper,” down deep we respected our competitors. We developed pretty swift camaraderie and respect with Trib staffers who joined the Register staff. I don’t think I saw or heard more than half a dozen incidents of lingering resentment from the days of competition. AM deadlines cultivate procrastination. Two things guide when journalists turn their stories in: deadlines and families. Trib staffers were used to turning in stories in mid- to late morning. Unless they had to cover evening events, they were home at a decent hour for dinner with their families. They and their families expected and wanted that lifestyle to continue when they worked for a morning paper. Register reporters, on the other hand, were used to turning their stories in by their deadlines — maybe 7:30 p.m. or so for the state edition, 11 p.m. for the central Iowa edition and midnight or later for the metro edition. As the chief assistant city editor, I supervised a reporting staff of something like 30 or 40, drawing heavily from both papers’ former reporting staffs. Not long after the Trib died, I started hearing grumbling about preferential treatment of former Trib staffers because they “got to” leave earlier in the evening than Register staffers. Well, we had only two news reporters assigned to work evenings: a cops reporter and a night general assignment reporter. Other beat reporters, such as the city hall or education reporter, had to work evenings if they had meetings. But everyone else worked as long as it took to finish their stories. The preferential treatment of ex-Tribbers was simply that they turned in their stories earlier. They were used to dinner with their families, rather than working right up to an evening deadline. I wish I could report that Register reporters learned to turn their stories in earlier and go home. Sadly, I think more ex-Tribbers eventually learned to work later in the evening. That’s a quaint bit of journalism culture that I think will go the way of afternoon newspapers: With the constant deadlines of the digital world, the deadlines of the morning newspaper will matter just to the few editors who process that product. Newsrooms heal slowly. The death of the Tribune was a cloud over the Register’s newsroom for months, perhaps years, afterward. We missed the fired colleagues. The sense of fun that makes newsroom life special was damaged and it took some time to return. I’m not sure when you would say the wounds were healed: A vigorous 1984 Iowa caucus campaign certainly helped. That year Time magazine named us one of the nation’s 10 best newspapers and recognition certainly aids healing. But when I left in 1985, I think you could still feel and see the damage in that newsroom. It reminds me of how frustrated I was back in the 1990s. I left The Register in 1991 to work on Tom Harkin’s presidential campaign. Not one of my better moves as it ended nine weeks later, but it plunged me into an amazingly creative period. I learned a bunch of new things, thanks to my sister “making” me get an Apple Macintosh SE, and remember where I was sitting when I logged into AOL, CompuServe and Prodigy for the first time and knew instantly the communications business was about to change by warp speed. Being a part of the Register and Tribune family from birth, I hated seeing the demise of the Trib and the cutting back from being a state-wide newspaper to Golden Circle-centric. So when it sunk in that the Internet would allow newspapers to maintain a state-wide readership without the distribution costs of sending trucks hither and yon, I marched into the publisher’s office and must have come off like a Pentecostal preacher. He didn’t own a computer, let alone have a CLUE what I was talking about, and basically rolled his eyes. Imagine, Steve, how different things would be today if newspaper had gotten ahead of realtor.com, craigslist, spot crime, yelp, etc. etc. etc.? So, I tried a different tack. I approached the Iowa Newspaper Association. I even had a software guru create a calendar that was searchable by date, location, price, etc. It was a fabulous calendar app and the Iowa newspapers could have plugged their event data in and a fabulous tool would have been available for all members of the association. Turf wars between Dubuque, CR, The Register, etc, put an end to that idea.